1. Preparation of a concept report in accordance with Section 103.3.4.2.1 by a qualified design professional. 2. Design preparation by a design team headed by a qualified principal design professional. 3. Coordination and verification via the principal design professional as a design team leader, with other design professionals, owners and contractors, when applicable. 4. Submit plans and supporting documents to the code official that shall identify which portions of the design are performance based and which portions are based on the prescriptive code. The submittal must include deed restrictions proposed to cover future maintenance requirements and special conditions for the life of the building. 5. Plan review is to be conducted by the code official staff when qualified for performance-based design. 5.1. When staff is deemed not qualified for a proposed project, acquire qualified contract review services. 5.2. Peer review is an optional approach for obtaining an additional review that is supplemental to the plan review. 6. 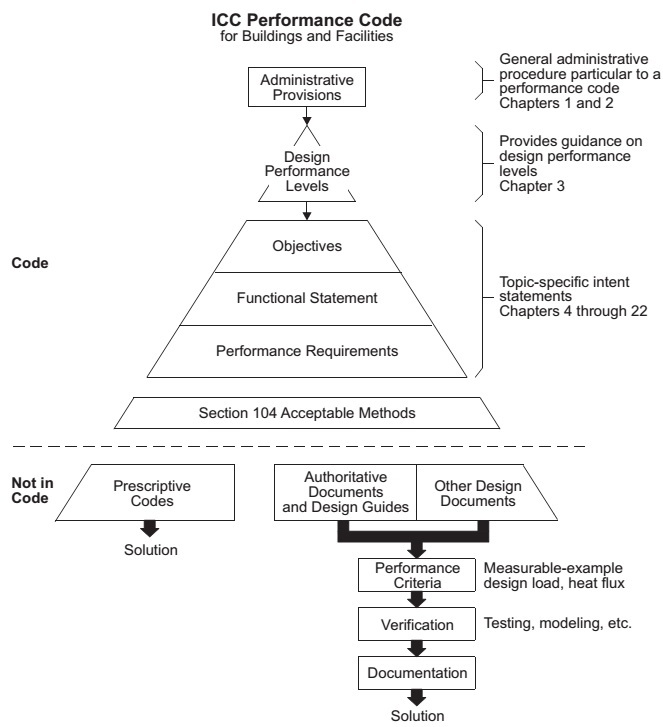 The code official verifies that applicable prescriptive code provisions and performance-based objectives are met. When special inspections are required, ensure that documentation is complete. 7. The code official approves plans and issues a permit. 8. The holder of the permit is responsible to construct in accordance with approved plans and documents. 9.1. Phase inspections [reference International Building Code (IBC) and other International Codes]. 9.2. Special inspection (reference IBC). 9.3. Testing where required by design documents. 9.4. Documentation that all requirements are met. 10. Issue Certificate of Occupancy with applicable conditions, where required by the approved design documents. 1. Examine applicable design documents, deed restrictions and maintenance requirements to determine building requirements where the original design is performance based in nature; prepare a concept report in accordance with Section 103.3.4.2.1. 2. Any features based on a performance approach need to be clearly differentiated from features of a building or facility designed using a prescriptive approach. 3. Verify compliance with the operations and maintenance manual. 4. Prepare a report specifying impact and requirements for the proposed design. 5. Prepare design documents based upon applicable performance, prescriptive or combination of code provisions and specify which codes are applicable for each portion of the design, including any steps to correct identified deficiencies. 6. Submit reports to the code official for review and acceptance, similar to procedural steps for a new building. 1. Document existing building features and systems that impact fire or emergency performance. 2. Verify compliance with the operations and maintenance manual. 3. Prepare appropriate design fire scenarios pertinent to the building or facility and actual use, considering existing mitigation strategies and protection features. 4. Evaluate performance against Section 304, Maximum Level of Damage to Be Tolerated. 5. Prepare a report detailing impact; design and test systems to the objectives in Part III of this code. 6. Submit for review and approval in accordance with Chapter 1. The following chart is provided to give guidance as to how the ICC Performance Code for Buildings and Facilities is intended to work. Essentially, this chart walks the user through the steps of applying the code. These steps begin with understanding the administrative process and the objectives of the ICCPC and eventually determining the acceptable methods used to design, construct, test, inspect and maintain the building or facility.